An excerpt from The Book of Tibetan Medicine by Ralph Quinlan Forde. “Padmasambhava gave special secret instructions for the creation of treasure vases (terbum) to help the practitioners of Dharma. There are two types of treasure vases: wealth vases and earth vases. Wealth vases are created with many precious things, such as crystals, jewels, mandala pictures of wealth deities, mantras and special pills. Having such vases in the home is said to bring good fortune, prosperity (both material and spiritual) and good relationship with people. Earth vases, when blessed and activated, can affect the environment for 24km (15miles) around, and are normally buried in the ground to restore the earth’s life force. They are prepared with conch shells, turquoises, crystals, cowrie shells and iron pyrite, and they impart life essence to gods, humans, nagas, dakinis (female deities) and local protectors, and to the Dharma practitioners in the area. Earth vases are also said to restore the 5 elements of the environment, from which all things are composed, and to impart healing to nagas for the pain and suffering caused by pollution. Earth vases generate good health, long life, plentiful harvests, environmental protection and peace. 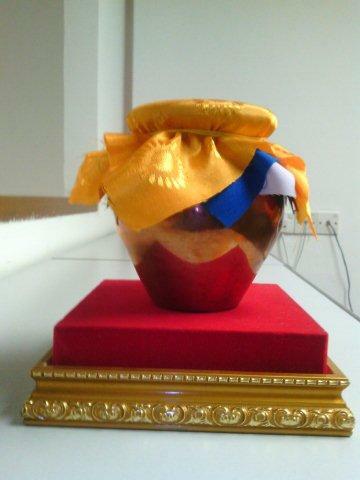 You can purchase here your own GURU RINPOCHE Wealth Vase, consecreated by Tulku Pema Rinpoche of Tana Monastery, South India. Click here to download the Purchase Form in DOC format. Click here to download the Purchase form in PDF format.